Following up on my previous post Cloud based CI with Platformio, after we have the build output from the Continuous Integration process, we are able now to deploy to our devices. This last deploy phase of the cycle Develop, CI, Deliver using Cloud infrastructure, only makes sense to devices that are powerful enough to have permanent or periodic network connectivity and have no problems or limitations with power usage, bandwidth, are in range and are able to remotely be updated. In reality this means that most low power devices, devices that use LPWAN technologies like LoraWan or SigFox, devices that are sleeping most of the time and are battery powered are not able to be easily updated. For these cases the only solution is really out of band management by upgrading locally the device. So the scope of this post is just to simply build a cloud based process to allow ESP8266 devices to get update firmware from the CI output. On it’s simplest form all we need is to create a web server, make the firmware available at the server and provide the URL for OTA updates to the ESP8266 that use the HTTP updater. One can already use from the squix blog the PHP file to be deployed on PHP enabled web server that delivers the latest builds for devices requesting over the air updates. The simplest way of making the Squix PHP page available on the cloud is to use the great Platform as a Service Openshift by RedHat. The free tier allows to have three applications (gears) available and the sign up is free. At sign up time we need to name our own domain suffix so that, for example I choose primal I’ll have URL’s such as application-primal.rhcloud.com. Openshift offers a series of pre-configured applications ready to be deployed such NodeJs, Java, Python and PHP. So after sign up, all we need is to create a new application based on the PHP 5.4 template, give it an URL (it can be the default PHP), and that’s it: we have our PHP enabled web server. 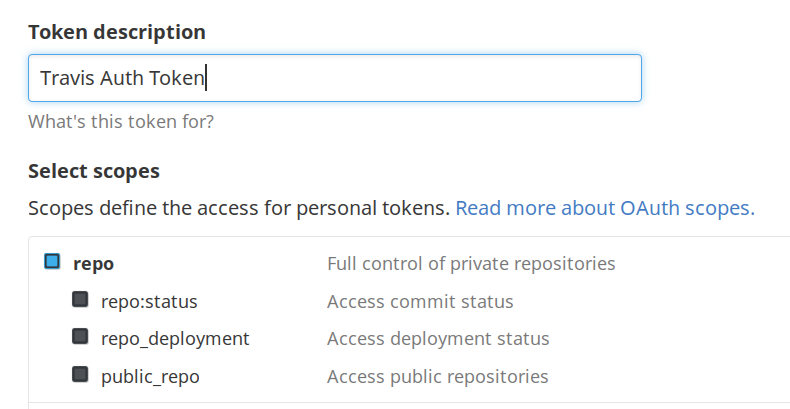 To deploy code to Openshift we use the Git tool for manipulating our application repository on the PaaS cloud platform. So we must first clone our repository locally, modify it and then upload the changes. If the gem tool is not available, first install Ruby (sudo pacman -S ruby). We then setup the rhc tool with the command rhc setup. Complete details here. You have access to 2 applications. [pcortex@pcortex:php]$ git commit -m "Added firmware.php file"
Writing objects: 100% (3/3), 924 bytes | 0 bytes/s, done. With the above firmware.php file we can deliver a single firmware file to any device that calls the page. and of course, add some security. Normally I don’t use or look solutions for problems that I don’t have. And for this reason alone, meant that http://platformio.org/ stayed under my radar for so long. Since I’m building my mailbox monitoring solution, I’m using two different types of Arduino boards: a Arduino nano 328p based board for the RF gateway, and some Digispark AtTinny85 based boards for the sensors. The Digispark AtTinny85 boards are not completely energy efficient for battery power sensor usage, but they are good enough to be used as initial proof of concept. To be able to program the Digispark board, I had to use the Arduino IDE, and through the IDE Boards Manager, add support for them, so that these new boards are available to be selected and programmed. – The first one is that after selecting on the IDE the board type, every window instance of the IDE assumes the same board. This means that I can’t have side by side one Arduino IDE window for the RF gateway based Atmega328p board, and other window for the AtTinny85 sensor board. I have to constantly change board types depending of what code I’m working for. A good solution (as the Platformio uses) should to associate the board type to the project, but that is not possible on the Arduino IDE. – The second problem, is that the last Arduino IDE tools update broke the integration between the native Arduino boards and the Digispark based boards. I can have support for one of them or the other, but not both at the same time, otherwise I get errors. There are some discussions on the Arduino forums that acknowledge the issues that I’m having. Still I could use one IDE/editor for one type of board, and the Arduino IDE for the Attinny boards, but is not very efficient. Anyway, the Arduino IDE is too much hassle when complexity starts to grow. I’m already using the Netbeans IDE for programming the ESP8266 and the KDE Kate editor for some Arduino basic programming, so that all I need was something that supported the Digispark AtTinny85 toolset. And so, I have several problems, which means I need to look for a solution, and preferably one that unifies all the platforms. Platformio is an open source toolset that allows, using the same base tools, to target different target environments: Atmel/Arduino, Espressif ESP8266, ARM, and so on. This means that from a unified toolset/IDE I can target different platforms, and one important thing, the target is defined by project and not by the tool or IDE, which solves my first problem. Also Platformio, since it supports out of the box several targets, it probably also solves problem number two of having possible future clashes between different device platforms/architectures. The command line tool supports searching and installing support for the several boards available on the market, and also allows to search and install user contributed libraries. 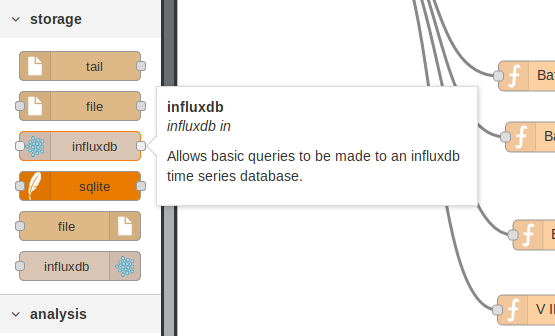 Anyway, the Platformio docs can explain better the purpose and capabilities of these tools, but the greatest achievement of this is that allows an unified toolset to be used for different boards/targets. – Platformio – This is a Python based command line tool that unifies the compiling, uploading, library management, and so on. – Platformio IDE – This is a NodeJS, Atom Editor based IDE that integrates the Platform tools on the IDE. 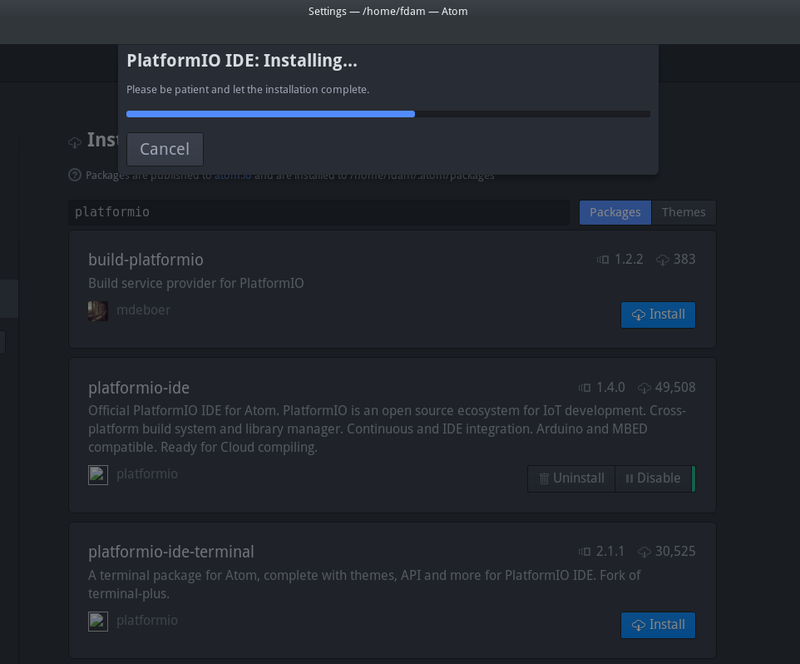 While I had no issues, worth of mention, on Arch Linux, in using Platformio cli tools, the IDE has a lot of issues, not due to Platformio IDE, but due to Atom editor and supporting software (Electron). I’m still not able to use the IDE to it’s full potential, but as an editor that has code completion and project management it works fine, but so far for me, upload to the boards must be done through the command line platformio tools. The platform 'atmelavr' has been successfully installed! The rest of packages will be installed automatically depending on your build environment. And that’s it. We can start to edit the src.main.cpp file, add libraries to the lib directory, execute pio run to compile, and pio run -t upload to upload to the board. And that basically it for the Command Line tools. This will bring also the node-js and electron platforms. We can now start the Atom editor to add the package Platformio-IDE. Installing the package Platformio-IDE will also pull the Platformio-IDE-Terminal. In my case, after starting Atom, the main window appears, but nothing else works. For example, going to Edit->Preferences to try add the Platformio-IDE package does nothing. The same applies to other menu options. On the other hand, running atom as root, seems to work, but is not a solution. The menus should start to work and we should be to install the platformio-ide package through the IDE Graphical Package Manager. Just go to Edit->Settings->Install search for Platformio and add Platformio IDE. The Platformio IDE Terminal will also be installed automatically. If, as in my case, we are behind a corporate proxy, we set the proxy environment variables on a terminal session, and start atom from there. After installation the Platformio menu and toolbar should appear. – Install the packages: npm install. Start again the atom editor. The terminal should work now. If not, atom might complain and show a red icon bug on the bottom right side. Just press it, and choose module rebuild, restart atom and it should be ok. While the installation and usage of the command line tools is straight forward and it works out of the box, the Atom based IDE is another story. It has a steep installation curve, not Platformio fault, but due to the number of components involved. Also those issues might be due to my Linux distribution (Arch), but still, it might be a real show stopper for some users if this happens on other distributions. I’ve lost some serious hours debugging this 🙂 to arrive to an almost fully functional IDE. Anyway at the end, the platform and the IDE are fantastic. With code completion, platformio tools seamlessly integrated, including simultaneous serial port monitoring to different boards, support for different targets and so on, is really a great product. Platformio is highly recommended as also the IDE, despite it’s rough edges. After building, on the previous posts, the Node-Red based backend to support E2EE (End to End Encryption) so we can log data into a central server/database, from our devices securely, without using HTTPS, we need now to build the firmware for the ESP8266 that allows it to call our E2EE backend. The firmware for the ESP8266 must gather the data that it wants to send, get or generate the current sequence number for the data (to avoid replay attacks), encrypt the data and send it to the backend. On the backend we are using the Java script library for cryptographic functions Crypto-js, and specifically we are encrypting data with the encryption algorithm AES. So all we need is to encrypt our data with AES on the ESP8266, send it to the Node-Red Crypto-js backend, decrypt it and store it, easy right? The code variable AESKey the way it is used on the above example encrypt and decrypt functions isn’t really a key but a passphrase from where the real key and an initialization vector or salt value is generated (I’m using the names interchangeably, but they are not exactly the same thing except they are public viewable data that must change over time/calls). The use for the generated key is self explanatory, but the initialization vector (IV) or salt value is used to allow that the encrypted data output to be not the same for the same initial message. While the key is kept constant and secret to both parties, the IV/salt changes between calls, which means that the above code, when run multiple times, will never produce the same output for the same initial message. Still referring to the above code, the algorithm that generates the key from the passphrase is the PBKDF2 algorithm. More info at Crypto-js documentation. At the end of the encryption the output is a OpenSSL salted format that means that the output begins by the signature id: Salted_, followed by an eight byte salt value, and after the salt, the encrypted data. So if we want use the API has above on the node-js/crypto-js side, we need to implement on the ESP8266 side both the AES and PBKDF2 algorithms. I decided not to do that, first because finding a C/C++ implementation of the PBKDF2 algorithm that could be portable and worked on the ESP822 proved difficult, and second the work for porting it to the ESP8266 won’t be needed if I use a KEY/IV directly, and so I decided to use the more standard way of providing an AES key and an initialization vector for encrypting and decrypting data. // The AES encryption/decription key to be used. Now, with above code, where the IV is always initialized to the same value, in this case ‘0000000000000000’, we can see when running the above code several times that the output is always the same since the IV is kept constant. Also the encrypted output is now just the raw encrypted data and not the Openssl format. So to make the above code secure we must randomize the IV value for producing an output that is always different, even from several program runs when encrypting the same source data. As a final note, if we count the number of HEX characters on the Key string, we find out that they are 16 bytes, which gives a total of 128 key bits. So the above example is using AES128 encryption, and with default Crypto-js block mode and padding algorithms which are CBC (Chain block mode) and pkcs7. I just added the code from the above library to my Sming project and also added this Base64 library so that I can encode to and from Base64. The N_Block defines the encryption block size, that for AES128 is 16 bytes. // The AES library object. // Our AES key. Note that is the same that is used on the Node-Js side but as hex bytes. // Our message to encrypt. Static for this example. // The AES encryption/decryption key to be used. So, as the message shows, it WORKS!. AES encryption on the ESP8266 to a Node-JS Crypto-JS based code where decryption occurs. So all is needed now is to build on the ESP8266 side the message with the encrypted data and the IV, and send through plain HTTP a JSON object to the Node-Red back end. On the Node-Red back end the decryption can now be done easily as was shown on the above testing code.